Due to the capacious and well-maintained storage unit, we keep a large stock in a safe place to ensure complete safety. This unit also helps us in maintaining high quality standards. Only after getting approval from the quality experts, we make use of the inputs sourced from the vendors. We make sure that our entire range is of excellent quality and faultless. 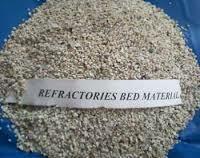 Crushed Fire bricks castables IS8 grade or River silica sand.